Cook chicken pieces with ginger, garlic, pepper powder, chilly powder and salt. When cooked and cooled enough, mince chicken pieces along with shallots in a food processor and keep aside. Melt butter in a saucepan, stir in 1 tbsp all purpose flour and cook stirring, for 30 seconds. Whisk in milk and cook, stirring, over medium heat until mixture turns very thick. Remove pan from heat. To half of the white sauce, stir in minced chicken, garam masala and coriander or parsley leaves and mix well. If needed add rest of the white sauce. (Do a taste test and adjust seasoning accordingly). When the mixture is warm, shape them into croquette shapes. Place bread crumbs and ¾ cup all purpose flour on separate plates and set aside. 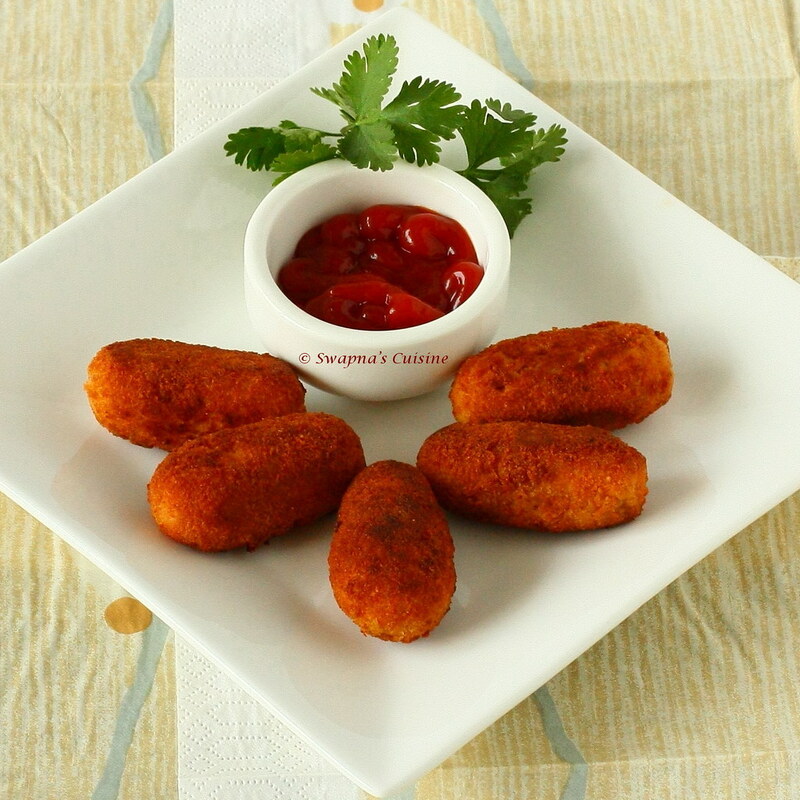 Roll each croquette in flour first, and then dip in beaten egg and roll in bread crumbs. Place it in a container lined with parchment paper and refrigerate until ready to fry. For frying; heat oil in a pan and fry croquettes for 3-4 minutes or until golden. Wow ..! That's perfect croquettes..The colour,the ingredients,God,I am gone for it ! perfectly and detectable chicken !! Makes me drool,super tempting croquettes.. 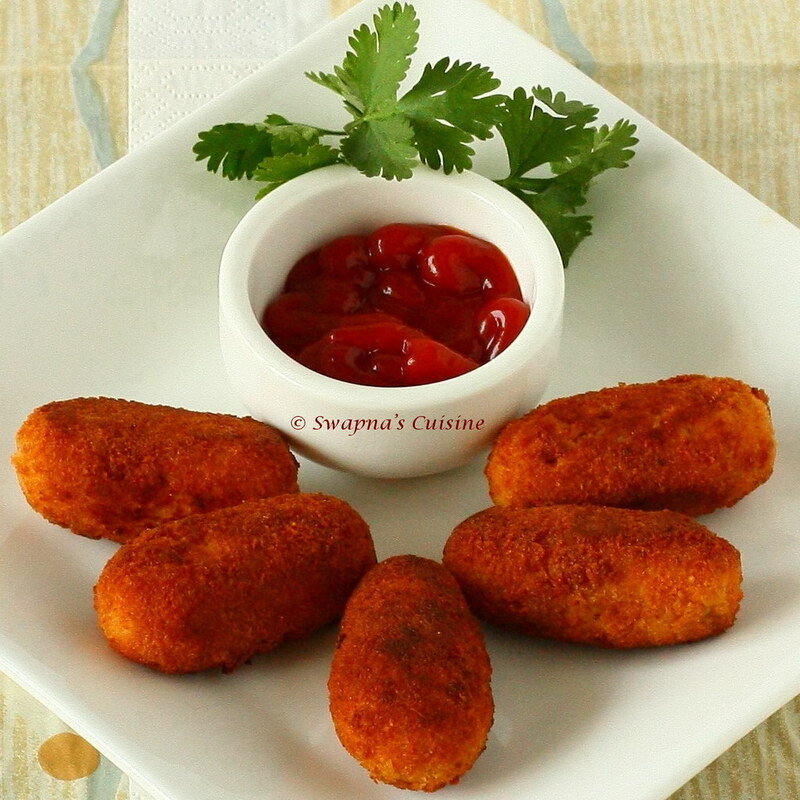 The croquettes look awesome Swapna, crisp and just the right color! how to cook the chicken? Can I use cheese I instead of white sauce? I tried this recipe...absolutely loved it...thanks for posting! !